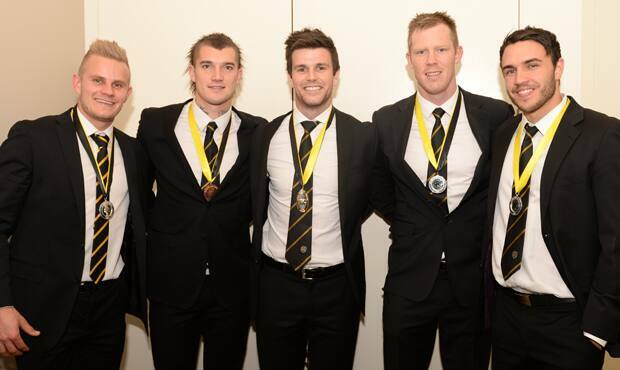 The top five vote-getters in the 2014 Jack Dyer Medal, (from left) Brandon Ellis (2nd), Dustin Martin (3rd), Trent Cotchin (1st), Jack Riewoldt (5th) and Shane Edwards (4th). In the lead-up to the 2015 Jack Dyer Medal, we list some key historical information about Richmond’s Best and Fairest award. Richmond will stream the 2015 Jack Dyer Medal event from Crown Palladium, live on richmondfc.com.au, from 7.05pm on Tuesday, October 6.